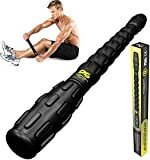 There are many variations of muscle massage sticks available on Amazon.co.uk, however the question is – which one do I need and what is the difference? It is essential that you purchase the right one for your specific requirements. To help you Physiosupplies.com have put together this comprehensive guide containing all of the information and advice that you will need to make the right choice. Here you can learn the differences between the types of sticks and rollers available, get an insight into the differences between smooth and textured surface sticks and discover why some muscle massage sticks are more expensive than others! Once you have read the information and decided which types and styles of trigger point massage sticks are best suited to you, we then filter down the results based on your selections within Amazon.co.uk to provide you with a comprehensive list of the best-selling massage sticks available thus ensuring that you purchase the correct type of stick for your rehabilitation, exercise or training requirements for the best price. 1 What are Massage Sticks? 2 What Do Massage Sticks Do? With the explosion of trigger point therapy and the advantages that self myofascial release (SMR) can bring, massage sticks and muscle rollers have become a standard piece of gym bag equipment used by regular gym goers, runners and athletes. Most massage sticks comprise of either a solid or flexible centre bar with handles at either end. Along the centre bar are individual rollers that rotate independently. The user applies the amount of pressure that they wish to apply, and simply rolls the stick up and down the muscle area they wish to massage. This is carried out by pushing and pulling the stick smoothly over the effected muscles. Physiosupplies.com is here to give you a brief insight into what differences one massage stick from another – as they are not all the same! What Do Massage Sticks Do? Painful aching muscles have many causes but most of us will be affected at some point in our lives. Whether it be as a result of an injury, over training, bad posture or just poor nutrition we are all likely to suffer from some type of muscular pain and discomfort. 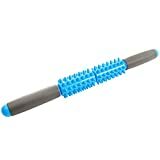 Trigger Point Massage Sticks and Rollers are lightweight and compact, portable and easy to use. They allow the user to target painful trigger point areas with the application of pressure to help relieve muscle pain and soreness, increase flexibility and mobility whilst also boosting circulation. Athlete’s and runners tend to use leg and calf massage sticks after a run to quickly ease those painful muscle areas. This technique is called Self Myofascial Release (SMR) and is also known as trigger point therapy or self-massage. In recent years the SMR technique has moved away from the exclusive arena of professional athletes to become a familiar everyday practice at all levels which provides the user with the ability to control their own recovery by applying pressure where they need it most. In addition to relieving muscle pain, this technique also works to improve blood and lymphatic circulation and has the potential to increase performance making it not only an effective tool in post injury rehabilitation but also a useful way to prevent injury. Muscle Roller Sticks are suitable for use both pre and post workout, ideal for use on legs, arms, back, neck and shoulders, calves, thighs and quads. When purchasing a massage therapy stick, there are number of things that you need to consider before making your selection. Some surfaces are smooth, and others are spiky or ribbed. It comes down to personal preference really. Different manufacturers make varying claims with regards to the benefits of the advantages or disadvantages. Different muscle roller sticks have varying amounts of rollers. Some have only 1 and the most we have counted on a stick is 14! We recommend between 2 – 8 rollers. Some trigger point therapy sticks have a flexible core, the reason for this that it allows the user to treat a larger area. If you have a rigid muscle roller stick, we feel you can apply a lot more pressure to a wide area, but you cannot be so specific on small muscle groups. The length of the massage sticks is quite important (not only for being able to fit it in your gym bag) as the longer the stick is – the wider area of your body it will cover. So if you are intending it to use primarily on your back – then maybe you would want to consider a longer length massage stick. Alternatively if you are looking to target mainly legs, calf, quads and hamstrings – go for a standard length (approximately 46cm).